In a perfect world, Snakes on a Plane would have lived up to its pre-release internet hype and spawned a bunch of imitators. And not Asylum-level crap like Snakes on a Train, either, but real movies--okay, movies that would be as close to “real movies” as something like this could be. Movies like Bait, which would be called Sharks in a Supermarket in that perfect world. 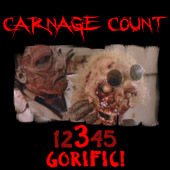 That’s the hook for this one--it’s sort of like Deep Rising floods into Die Hard and Jaws, which really just makes it more of an everyman’s Deep Blue Sea--just replace scientists and a compound with a bunch of average Joes and a meat market. When a tsunami hits a small Australian town, a bunch of folks are indeed trapped in a grocery store with a twelve-foot great white shark. Honestly, there’s not much more to it than that--the group is comprised of various personalities, and they have to learn to band together and even work through some distrust since one of them (Julian McMahon) was in the process of robbing the joint before the giant wave flooded the store. Bait’s concept is so threadbare that it really could have been titled Sharks in a Supermarket and a Parking Garage because it actually bounces between both of those settings in an attempt to fill out the run-time. The latter one is populated by a couple who were making out before they were trapped there, and they spend most of the time acting as the film’s levity since they’re bickering about inane things. Nevermind that they’re submerged underwater in a car, surrounded by a giant shark--it’s more important that they sort out if the gal’s really wearing $300 Gucci shoes or not. Such moments make Bait seem like the type of film--like Snakes on a Plane--that’s in on the joke, but, as it turns out, there’s a reason they didn’t go with a silly title: Bait isn’t exactly silly. Sure, there are moments that seem silly--at one point, one of the survivors constructs a makeshift shark cage out of shopping carts, for example. But it’s not played for laughs for the most part, and, in fact, that particular scene pays off in an unexpectedly affecting manner. That sort of thing doesn’t happen all that often in Bait, but it’s not for lack of trying since it attempts to craft some semblance of characters, however cliché they might be. If there’s a lead, it’s Rory (Richard Brancatisano), the lovelorn store clerk who’s bummed out after losing his fiancé (Sharni Vinson) after her brother (and Rory’s lifeguard buddy) died a year earlier during a shark attack. Fate of course throws them together on this day, and you can set your watch to the sappy conversations between the two. The same is true of the estranged father and daughter duo who find themselves at odds when the latter is caught shoplifting. All of the drama serves the basic function of making these characters distinguishable if nothing else. And, really, there is nothing else--there’s sharks and bait, with the two occasionally mixing whenever the characters find themselves in other perilous moments. It’s not enough that they’re fending off sharks, as they also have to contend with a sparking power line that’ll send the whole place up in flames if they can’t shut the power off. Ultimately, Bait is sort of a collection of those sequences, and, while some of them are nicely constructed, the film lacks a proper sense of propulsion to stay thoroughly suspenseful, especially since it’s bouncing back and forth between the store and the parking garage. It does so without any sense of grace or pacing, as there are long stretches where the film forgets about the latter bunch. Some of the individual scenes do work, though, and the slick production does what it can to overcome the narrative choppiness. 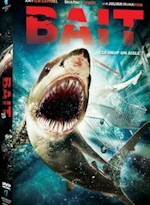 Bait eventually separates itself from the recent shark movie pack by featuring good-to-great shark effects. Some CGI shots are disconcertingly awful and cartoonish, but the effects are generally weighty, especially when director Kimble Rendall opts for a practical shark in certain scenes. Maybe recent offerings from SyFy and The Asylum have lowered the bar and results in Bait being graded on a bit of a curve, but it achieves a major victory by featuring shark effects that aren’t immediately guffaw-inducing. Had Bait been able to commit to a tighter story or a more consistent tone instead of juggling jokey asides with the sometimes mawkish seriousness, it might have been a truly special gimmick thriller. As it stands, it’s just a pretty decent one with some occasionally fun and effective moments, which is pretty good for this particular genre especially. Bait had a long path to production--at one point, Russell Mulcahy was attached to direct, and he still gets a screenwriter credit here (along with a staggering five other writers, with is about four too many considering this film’s premise). Rendall ended up with the gig and delivered a serviceable film that doesn’t quite deliver on the promise of the ridiculous high concept--in the end, it’s played just a little too straight and conventionally. It might be more accurate to say that a perfect world would have a film that’s a perfect mash-up of this and Shark Night. Whereas this one gets the effective gore and suspense sequences, that one had the perfect tongue-in-cheek approach that Bait could have used. Instead, we’re left with two pretty fun shark movies, both of which are a little too forgettable considering how gonzo they are at times. Unlike Shark Night, Bait didn’t make it to theaters, as Anchor Bay has brought it straight to home video, where it receives a nice presentation. The Blu-ray features a crisp, detailed transfer and an enveloping 7.1 DTS-MA track; special features a re a little light since there’s only a storyboard gallery, but there’s also a 3D transfer of the film as well. For shark movie aficionados who have grown tired of the all-too-steady diet of cheap, flavorless offerings, Bait is a nice reminder that this genre still has a little bit of bite, even if it is nothing more than a fun diversion. Rent it!